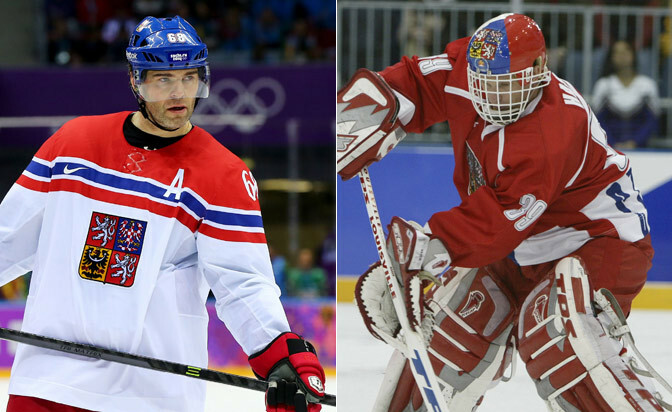 In the wake of the Czech Republic's loss in the bronze-medal game of the 2014 IIHF World Championship in Minsk, two of that country's biggest hockey stars, Jaromir Jagr and Dominik Hasek, have engaged in a war of words. Jagr, who played on the team which lost to Sweden 3-0, and Hasek, the goalie who backstopped the country to gold at the 1998 Winter Olympics, were teammates in the national team setup for years. But they are on differing ends of a the spectrum about the debate gripping the country at the moment, which centers around the criticism the national team's players are facing in the face of the disappointment this weekend. Jagr, who plays for the New Jersey Devils and led the Czechs with four goals and eight points in 10 games at the World Championship, was angered by the attacks on the team by fans and the media. "Why don't you go ask these experts, who never won anything?" said Jagr, who announced his retirement from the national team after the bronze-medal game. "I am not saying I'm a genius, but I've played hockey for 25 years and I know what I am talking about." In Jagr's opinion, fans should support the national team no matter what, rather than criticize. "Players should feel the support of the fans and media. They should know we all stand together," he said Tuesday in Prague. "The players come to represent their country for free. I think it's like when a singer comes to perform at the charity event and he gets booed. I wonder why this does not happen in Russia. Why do the Russian stars always want to play for their national team and the Czech stars don't? We are a small nation; we cannot afford criticism. We should all stick together and have one goal." Jagr's standpoint seems to be similar to the one of Alois Hadamczik, who had coached the Czech team at the 2014 Sochi Olympics and tried to blame the media for its bad results. However, Hasek does not agree with such perspective, believing the team and its players are fair game for criticism. "What [Jagr] said is inexcusable," Hasek said in the Tuesday edition of Czech daily newspaper Sport. "He tried to make people feel that he is something more than those who criticized him. He told them, 'I am the one, and you have no right to criticize me.' That's bad. I can never agree with such attitude. "If anyone else did that, I would say he was just stupid. But [Jagr] is a legend, greatest personality of Czech sports. He should know it's not possible to assault people just because they have different opinions. There will always be people with different opinions. It wouldn't be normal if there were none." Jagr, 42, posted reaction Wednesday on his Facebook profile. He said he had not talked about criticism of his own performance, but about the lack of support for the entire team. "I am not mad at Dominik. I just don't think he understood what I meant," Jagr wrote. Jagr also said he did not like how people criticized players like Jiri Hudler (Calgary Flames) or Jan Kovar without knowing much about their roles on the team during the tournament. Jagr and Hasek are two of the most decorated hockey players ever. Jagr is the highest-scoring European-born player in NHL history. He had 24 goals and 67 points in 82 games this season; he's seventh all-time with 705 goals and sixth with 1,755 points. He signed a one-year contract in April to return to the Devils for a 21st NHL season. He also had two goals and an assist in five games at the Olympics. It was the fifth time he played in the Olympics, including 1998 when he teamed with Hasek to win the gold medal at the first Olympics that featured NHL players. Hasek, 49, won the Vezina Trophy six times and the Hart Trophy twice during 16 seasons with the Chicago Blackhawks, Buffalo Sabres, Detroit Red Wings and Ottawa Senators. His 389 wins are 11th all-time, and his 81 shutouts are tied for sixth. He left the NHL after the 2007-08 season and played two additional seasons in Europe.